Attorney at law listed in the register maintained by the Warsaw Bar Association, where he passed his bar exam with honors. Graduated from the Faculty of Law and Administration at Warsaw University (with honors). He specializes in providing legal services to business transactions, consulting related to real estate, litigation, public procurement and legal services for TMT sector. He participated in precedence legal proceedings, including before the Constitutional Tribunal. He has experience in proceedings before the Energy Regulatory Office (URE), the Office of Electronic Communications (UKE ), the Office of Competition and Consumer Protection (UOKiK) and the Court of Competition and Consumer Protection (SOKiK). He has successfully carried out commercial (including unfair competition ) and civil disputes. He advises on matters relating to public procurement, especially in the execution of infrastructural contracts. He has represented individuals before the European Court of Human Rights in Strasbourg, and has also represented individuals and companies in criminal proceedings and criminal tax cases. 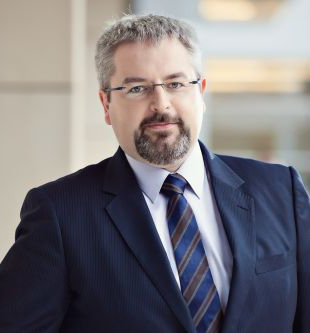 He is the author of numerous articles in the press inter alia in Rzeczpospolita daily, Przegląd Prawa Handlowego (Survey of Commercial Law), Dziennik Gazeta Prawna (Daily Legal Newspaper), eurofenix (Journal of INSOL Europe), Rynek Kolejowy (Railway Market), Kurier Kolejowy (Railway Courier), Nowa Energia (New Energy), Autostrady (Highways), Builder, Gazeta Ubezpieczeniowa (Insurance Newspaper), Rynek Turystyczny (Tourist Market), Przegląd Prawa Handlowego (Commercial Law Review), Przetargi Publiczne (Public Tenders), Prawo Bankowe (Banking Law) and Prawo Spółek (Company Law). Arbitrator from a list of judges maintained by the President of the Public Procurement Office (2004-2007). A member of the Competition Law Association, the Association of Restructuring Practitioners in Poland, INSOL Europe, the International Bar Association. The President of the Bankruptcy and Restructuring Section at the District Bar Council in Warsaw. Licensed trustee in bankruptcy, restructuring advisor. He is fluent in English and speaks conversational German.